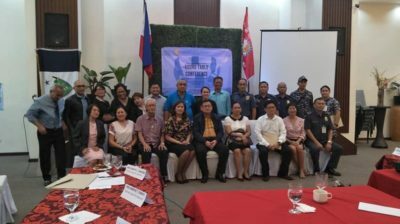 Heads and representatives of the pillars of criminal justice system (CJS) in Bohol jointly manifested their intent to a better coordination among them towards speedy disposition of cases by signing in the Commitment of Stakeholders capping the day-long round-table conference October 26, at the Belian Hotel. Organized by the Department of Justice (DOJ) Parole and Probation Office (PPO) in coordination with the Bureau of Jail Management and Penology (BJMP), the round table conference intends to consult with the key pillars on how each one can efficiently manage and perform their mandates by ironing out issues and concerns leading to the goal of speedy resolution of cases, says PPO 7 Regional Director Georgette Paderanga. Present during the conference were representatives of the community, law enforcement, the prosecution, the courts and the corrections. Leading the concerns which the PPO brought up was the problem with court referrals. PPA, which maintains 22 parole and probation offices in the region, has reported an upsurge in drug cases clients in the past years. This is largely due to the Supreme Court issued plea bargaining in drug cases to enable drug offenders to avail themselves of such arrangement. Although the plea bargaining framework is not allowed in drug cases where the imposable penalty is reclusion perpetual or death, or under Section 5 of Republic Act 9165 (Comprehensive Dangerous Drugs Act.) which penalizes sale, trading, administration, dispensation, delivery, distribution andtransportation of all kinds of dangerous drugs, a plea bargain to a lesser crime can be accepted. For example, the new framework says an accused charged with violation of Section 11 of RA 9165 for possession of dangerous drugs where the quantity is less than five grams (shabu, opium, morphine, heroin and cocaine, and less than 300 grams in case of marijuana) owns a penalty of 12 years and one day to 20 years in prison and fine P300,000 to P400,000, the accused can plea bargain to a violation of Section 12 on possession of equipment, instrument, apparatus, with a penalty of six months and one day to four years in prison and a fine ranging from P10,000 to P50,000, cited PPO administrator Dr. Manuel G. Co, during his pro-round table conference message. With the plea bargain, courts are then mandated to refer the accused eligible for probation to the PPO. PPO Tagbilaran City Aileen Rose Dumalesaid her office gets several court referrals but these do not have complete documents. A referral without complete documents could hamper the PPO assessment of the application for probation. Moreover, while the courts send in referrals, these do not come with thenotation that petitioner of the probation should report to the PPO within 72 hours. Other PPO offices also said that when there are referrals that arrive, the petitioners do not have home addresses, which makes it hard for the probation officers to conduct initial investigation if they do not know where to start. Former City Police chief George Vale who represented law enforcement pillar admitted that in some cases when the accused apprehended for a crime is non local, the accused often uses aliases or fake addresses and the police may not be able to know if the information is false. With this, the information forwarded to courts would sometimes contain no addresses, or false names. For the courts, the office of the Provincial Prosecutor also admitted that the increase in cases caused delays in the submission of post investigation reports, a fact that several of their referrals to the PPO may not have with them file folders this important document. The courts also insisted that as per mandate, the delay in the submission is also due to the delayed inter-office referrals as these have to be thorough, substantial and complete investigations and accompanying records. On these, the pillars of the justice system agreed to work on the motion for extensions, and a fixing of the processes in the documentation processes that includes a verified address to solve the issues of the PPO initiated investigation for approval of probation applications. The PPO also informed everyone that in several cases when the accused who have served part of their sentences are released based on recognizance. PPO RD Paderanga said some officials who vouch for thesereleases do not even know the person they are supposed to have under their supervision. “This is dangerous as they can be liable when the persons they accept commit new crimes or escape from their temporary custody,” the lady probation officer said. 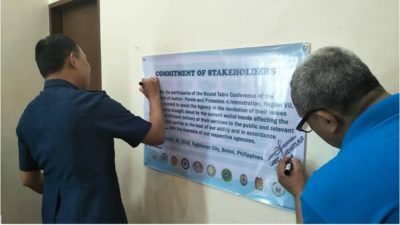 Over all these issues, the round table capped the day with the signing of commitment to assist the PPO in the resolution of their issues and concerns affecting the effective and efficient delivery of their services to the public.